One of the most important things any writer needs is good editing. It’s no mean task to get your work entirely free of grammar and spelling errors. While top-notch authors also rely on professional editors, the rest of us can opt for some really good editing tools. This is where tools like ProWritingAid come to the picture. And what sets ProWritingAid apart is the fact that it not only corrects your writing but also helps you learn the basic rules. Whatever is the level of your writing, you can improve upon it since ProWritingAid will compare it with the best in the business. ProWritingAid is more than just an average grammar and spelling checker. It not only does the average Grammar and Spellcheck but also tells you about things like overused words and paragraphs which are hard to read. ProWritingAid prides itself as a style editor, Grammar guru and writing mentor all rolled into one. It is a great tool for authors, copywriters, students, professionals, and content writers. ProWritingAid has both free and paid editions. The web-based version which is free has a word limit of 500 words per document. When you opt for an upgrade to the premium version, you get and add-on license from Microsoft and unlimited word counts. What are the differences between the free and the premium versions? Integrations for Docs, Word, Chrome etc. Premium Plus – It couldn’t get any better with Premium Plus. This includes all the features as Premium, with an additional 50 plagiarism checks per year. It is slightly more expensive than Premium. If you really need this feature like in the case of authors, you can go for it. What are some of the best features of ProWritingAid? Having the best-standard of spelling and grammar check is a prerequisite but what we loved about ProWritingAid is that it is much better than Word’s and can also integrate into any form of writing, be it a word, online and more. So irrespective of where you write, rest assured, ProWritingAid will come to your rescue. Besides, it also suggests plenty of style improvement which makes editing so much faster and easier. The package includes contextual spelling alongside grammar and punctuation checking, which is a great value addition for any writer. There are not many tools out there that genuinely improve your writing. With ProWritingAid, features like Word Explorer are very useful since they help you find the right word. With the built-in thesaurus, you get a storehouse of knowledge regarding the choice of right words. Many times we just repeat the same words and do not realize it. ProWritingAid helps you detect repeated words and phrases by highlighting them helping you choose diverse words. This not only improves your writing and improves the reader experience. Sounds difficult? Even we could not believe this unique feature until we tried it. Their team of copywriters has covered thousands of rules to get you style improvements. This also helps to choose your style of writing. It could be anything from general, academic, technical, business and so on. According to the type of writing you choose, ProWritingAid provides suggestions. So for instance, if you choose casual, you will not be thrown complicated words which look out of place. More than 20+ reports which will appeal to any kind of writer in you. They support both Mac and Windows users, unlike most other tools which support only Windows. For instance, one of our favorite reports is the Ease of Reading score we get based on the Flesch Reading Ease formula. The score you get varies from one to 100. A high score indicates an easy to read a paragraph. 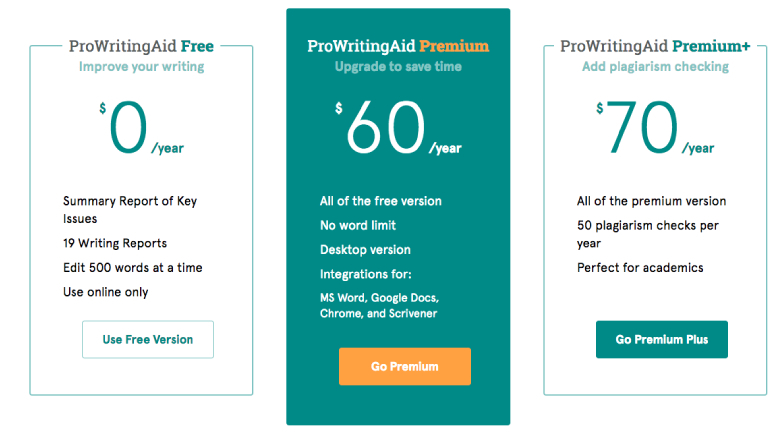 What is the pricing of ProWritingAid? What we loved is that ProWritingAid is pretty affordable, and it also offers you a lifetime version. In fact, it is less expensive than most editing and grammar check tools out there. This is indeed very useful for anyone who will be writing long time. There’s a two-week free trial version available. This is useful to help you decide if you need the premium version. ProWritingAid users have only positive things to say about the Editing tool. They have a ‘Wall of Love’ where you can check out what customers say about them before you buy. Reproducing one of the reviews from their site. Conclusion – Should you go for ProWritingAid? Summing it up, ProWritingAid gives in-depth analysis and perspective, reports to determine the strength of your writing and is very affordable. The integrations work with Docs, Word, Chrome, and Acrivener for a fraction of the price of Grammarly. This powerful tool with its amazing features will definitely improve your writing. Not just for casual writers, this tool is for all to learn the art of perfect writing! We totally recommend it.